In the Computer Lab we use a lot of different websites. To keep them organized and give students easy access to these tools, I use and electronic bulletin board, or eBoard. The computers are set to open to this website automatically. You are welcome to bookmark this site at home so your children can continue to practice the skills they are using in school or continue to work on projects at home. Click on the link below to access this EBoard. Keep up with the Computer Lab and Technology for Learning! With parents being so busy I have realized there is little time for parents to visit this website and learn about what their children are doing in the computer lab and about how computers can help student learning. To make it easier, I will be testing a resource called Bloomz to push information out to parents via email and/or text messages. Parents can easily sign up following the steps below. Once enrolled in my class, you will receive text messages and/or emails with information and pictures about lesson in the lab, tips on internet safety and computer use, cool websites your children may like and so on. I promise your phones and inbox will not be flooded with messages. I anticipate messages to be sent a few times a week, but no more than once a day. These messages will only go to those who are enrolled! Be sure to add your name to the list! Bloomz can be used on any device! Students in kindergarten through 4th grade spent the entire month of December learning to write computer code in the lab. Even begindergarten students gave it a try! And, while there were times it was difficult, all students learned the value of perseverance and logical thinking as they debugged (found problems) in their coding algorithms. Kindergarten and first grade students used a site called Kodable ( students have their own accounts, although it is available as a tablet app) for their introduction to computer programming. They were asked to guide a colorful fuzzball through a series of mazes by dragging commands, or functions, into an algorithm. If they put in the wrong function, they were not able to move on to the next maze until they debugged the algorithm. The mazes became harder as they moved along. After a while they were taught how to include conditionals that required students to figure out how to make their fuzzball follow a set of functions only if certain conditions were present. Every single student was successful at this! In second grade, students went the next step and began to learn a programming language called Blockly, otherwise known as visual coding. For their puzzles, students had to drag colorful blocks that had specific code functions attached to them. Their first task was to solve puzzles to get a monster around Mystery Island, find the treasure and escape the island. They learned how to use several types of conditionals, repeats (known as loops) and arrays. This program required students to really pay attention to directions and going back to reread them I when they did not understand their task. This was very difficult for many students because they would go back and reread the directions the same way they read them the first time. Once they understood they need to read differently (slower, step-by-step, etc), they were more successful. Just before vacation, second graders were introduced to the website, Run Marco. For this task, students had to guide Marco along a path in the rainforest. The beginning tasks were fairly simple, but when they began working on loops. students had to look for patterns to make their algorithm work. Students were encouraged to work in pairs for this, which really encouraged a lot of collaboration. Star Wars and Minecraft were the focus of activities for third and fourth grade students. Third graders entered the world of minecraft and used blockly coding to understand how Minecraft programmers have written the Java code that makes Minecraft run. Since so many students are regular users of Minecraft, an online/offline game that allows them to build imaginary worlds (think digital Legos on steroids). Again, students had to use conditionals and loops to master an increasingly difficult set of puzzles. In many of the puzzles, students could be successful without using the loops, but quickly discovered the value of efficient thinking (math teacher love!) since they had to drag in 20 or more functions in the correct sequence when they could have done the same thing with just four functions! Fourth grade students enter the realm of Star Wars and created their own short video game once they worked through their tutorial puzzles. The coding for these had the potential of being very intricate. I know students really enjoyed this unit and will be disappointed to have it end. I have created an entire page of coding websites on the Eboard and encourage you to have your students continue to code in class, during indoor recess, at home, walking down the halls and so on. I will work on additional coding opportunities in the lab as well. The coding for these had the potential of being very intricate.To see student works, click on the links below. After you watch the action, click on “See How it works” to see the code algorithm. Social media, including Facebook, Twitter, Snapchat and similar resources, is an important aspect of daily life for everyone, adults and children alike. Whether we like it or not, children will grow up "talking" to each other via their devices. But when is it okay for children to join the social media world? Social media services specifically are restricted to those over 13. The content on social media sites often is not appropriate for children under that age. Of course, we all know there are many children under age 13 using these services. It is a battle that is hard to win and often not as black and white as it seems. Check out this page on Common Sense Media for specific information about social media and elementary school children. media and digital resources. Here are a few that are recommended. Common Sense Media: This website is very thorough in its review of all media. The website states, "We rate, educate, and advocate for kids, families and schools." It is a very thorough site that I use a lot! Parenting magazine: This article gives some reasonable, brief guidelines to help parents. Social Media Alternatives: Check out some alternatives to Facebook and other social media sites. These are designed for children and have safety in mind. Enter the specific site in the search box on Common Sense Media (see above link) to get specific information about each site. More than ever before, typing skills (now more commonly referred to askeyboarding) are important for even our youngest learners. With children using computers as toddlers and more and more communication being done via a computer of some sort or another, students need to learn to type. Even state-mandated testing is requiring students to type their answers. Last year when third and fourth grade students took the pilot Smarter Balanced Test (this will not be a test Maine is going to use), students had to type lengthy paragraph and multi-paragraph answers. And, although speech-to- text programs are becoming more commonplace, they are not yet taking the place of conventional typing. At WES we have developed a program that gradually teaches students the skills needed to type accuratly and quickly by the time they reach middle school. As students begin to learn their alphabet and begin to write words, they will play games that combine the skills. Games such as Keyboarding Fun, Match the Letter, and Keyboard Cups are a couple of the games they will use. Additionally, there are many iPad apps that connect letter recognition to the keyboard. Grade 2: In second grade, students continue to learn where letters are on the keyboard, but also are introduced to the concept of home keys. They test drive the home keys with a website called Dance Mat Typing and are encouraged to practice the skills on other games, such as Keyboard Climber. They are not required to use the home keys regularly, but are encouraged to give them a try. Several other typing practice links are on the WESKids Eboard. Grades 3/4: In third and fourth grade, students are expected to use their home keys consistently. 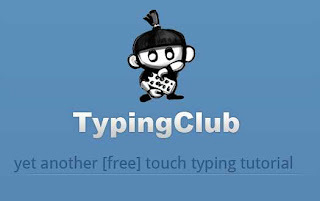 In third grade, students progress through the typing program at the Typing Club website. They use their Google account to sign in and go through each of the lessons through the year. Students are also reminded to use the home keys when doing regular schoolwork on the computer. By the end of third grade, students should be using their home keys 90 percent of the time. In 4th grade, students continue with the Typing Club website lessons and increase their speed and accuracy. By the end of the year, students should be using the home keys all the time and be competent with their speed and accuracy. A few years ago, as a third grade teacher, I had a couple of officials from Kennebunk Savings Bank as guests in my classroom. Students were showcasing some of the many ways we used technology tools to learn. As they prepared to leave their comments made it clear my use of technology was on the right track. "This is so much more than I ever imagined," one said. The other commented she was using a resource called concept mapping with her employees to plan a project and they were struggling with it. But yet, she stated, "You have 8-year-olds doing the same thing with ease." Technology in the classroom is more than simply playing games to help learn math facts. It helps students learn skills, both mental and social, that are important for being successful adults. Student engagement with technology is also improved, resulting in more learning. As an example, I recently was teaching a lesson on descriptive adjectives and adverbs. Typically, I would have students in a large group giving me words to put on a large piece of paper. That process worked well enough, but generally thee were several students hanging out waiting and counting the minutes until recess and not involved in the discussion at all. So, I added some technology to the mix and the results were amazing! By using what is basically a digital bulletin board, students, each on their own computer, added their descriptive words in live time. That means they could all se each others' additions as soon as they were posted. It didn't take long before students were typing as fast as they could with new words. When the time was up and they had to go out to recess, they wanted to stay in and keep adding words! Never before has that happened! In another example of how learning and engagement improve with technology, I asked students to use a concept mapping tool to record all of the concepts we had learned through the course of the year. Essentially, they were to use a text box for each concept. Next, they were asked to draw a line connecting any of the concepts that were related in some way. Within minutes students were gasping (Really, they were gasping!) with surprise. "Mrs. Cryer," they exclaimed, "It's making a big circle. Everything we learned is connected!" I knew I had helped my students discover something they likely would not have discovered in a long time, using a simple digital tool that took about 15 minutes to complete! As adults, we have to remember, students in school today, regardless of their grade level, have never lived in a world without personal computers. Therefore, using computers for learning is as natural to them as reading a book (which, by the way, most would rather do electronically as well). As teachers we strive to meet our students where they are and take them farther than they believe they can go. Technology is one key to their success and one which they are born to use. As your children go through the CORE schedule, they may come home announcing there is yet another new teacher in the computer lab! Many of you know, due to health reasons, Mr. Sprankle had to retire from WES. We all will miss him terribly and wish he could still be here with us. I have taken over as the computer teacher and, although I have some very big shoes to fill, look forward to the challenge. On this website I will post updates about what each grade level is doing in the computer lab as well as tips for parents about computer use, valuable websites for learning, information about internet safety and digital citizenship. To find the information about each grade level, look in the sidebar to the left. You will see a link for each grade level. In this section I will post general information that is valuable to all parents. Please feel free to email me with any questions you might have. I always try to respond within 24 hours. You are welcome to email me directly, mcryer@wocsd.org, or use the form on the contact me page by clicking the link here or in the left hand sidebar.